Should TellTale start making us regret choices? And while I'm sure there are many choices you regret, I guess my discussion title could probably be named a little better, but that's beyond the point. When I say this, there is an instance that comes straight to mind for me. In A House Divided, the whole instance between talking with Walter about Matthew, and how Nick accidentally killed him. Personally, like the majority, I decided to tell the truth because so far in this game, that always tend to be the best outcome. 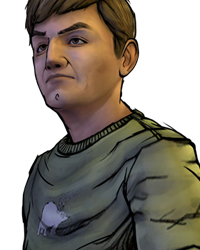 I also think that it was kind of an obvious decision that very many players would decide to tell Walter the truth and state that Nick is a good person. In my eyes, it would have been very interesting if those choices resulted in the opposite outcome. For example, if we told Walter that Nick indeed kill Matthew, he flat out knows. He's so angry and upset, that ultimately, he does end up letting Nick. I also think that it then would have been interesting to say perhaps we lied to Walter, then there isn't any way for him to find out it was Nick, and thus resulting in the scenario he saves Nick (because of not knowing he killed Matthew). I feel like it would have been much more interesting because it definitely would have been shocking and would surely make everyone question their decisions from then on out. You'd have to start thinking...."Will telling the truth help me in this case...or will it just cause more issues? Maybe I should lie....but then what if they find out.....?" I feel like it would bring in a lot more thought into the choices such as that, and that it could ultimately change the future decisions of players because of not knowing whether to stick with the truth or tell a few lies here and there. Should telling the truth keep us in the clear, with no bad outcomes, or should we sometimes be presented with a consequence result when we think we're doing the right thing? When I first played this episode I lied to Walter, the main reason for me doing that was because I didn't want him to snap and kill Nick there and then. I thought I was doing the right thing for our group, Rebecca was pregnant and needed rest, Kenny already had a problem with Luke and Nick and I didn't want to make that worse by telling him that we killed Matthew. Even if it was a mistake, at the time I had no way of knowing how he would react.